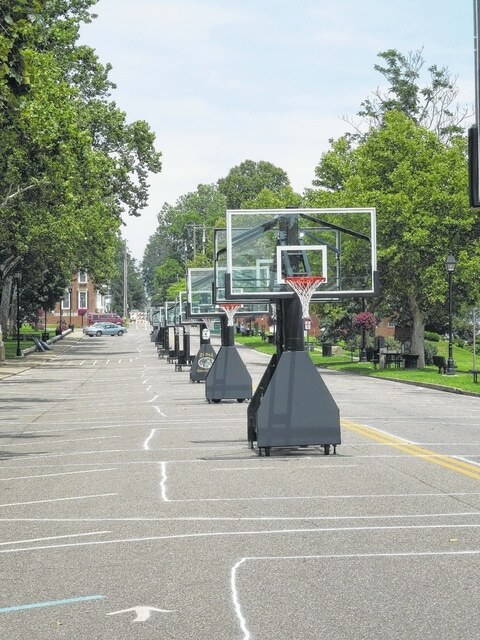 The Hoops Project has traditionally been held on First Avenue in Gallipolis. GALLIPOLIS — The Hoop Project makes its return for the 2015 summer season July 18-19 on First Avenue in front of Gallipolis City Park. The Hoop Project’s first year was in 2013. This will be the third year the Downtown Revitalization Project hosts the three-on-three full-court basketball tournament. With about six players on each team, Pugh anticipates there to be between 700 to 1,000 players competing during the upcoming weekend. Teams are self-organized by players. Occasionally, sponsors will host teams to pay the $100 entry fee. Pugh noted the event was not “for profit.” All money raised from the event is dedicated to funding further tournaments in the future. The hope of DRP is to “break-even” on the project. The money is meant to pay referees, buy shirts for participants as well as fund event trophies. Registration for the event ends at 6 p.m. July 15. No applicants will be considered afterward. A grand opening ceremony will be 6:30 p.m. Friday. An exhibition match will be conducted that evening as well. If the weather doesn’t cooperate, gyms have been reserved at local schools for the event to continue. Divisions for all ages will be welcomed. Gallia Got Sole will also make its first appearance Sunday during the Hoop Project. A shoe convention, individuals will set up shoe collections in the style of classic basketball Air Jordans and other styles of sneakers. The public can peruse collections and potentially buy or trade among collectors and vendors. Trenton Osborne is a local teenager organizing the event. For more information or to apply to compete in the Hoop Project, visit www.thehoopproject.com or www.galliagotsole.com.